The Circle Compass puts a nearly impossible task – routing a perfect circle – within easy reach. Start by attaching the suction grip to your material – quick, clean and secure. 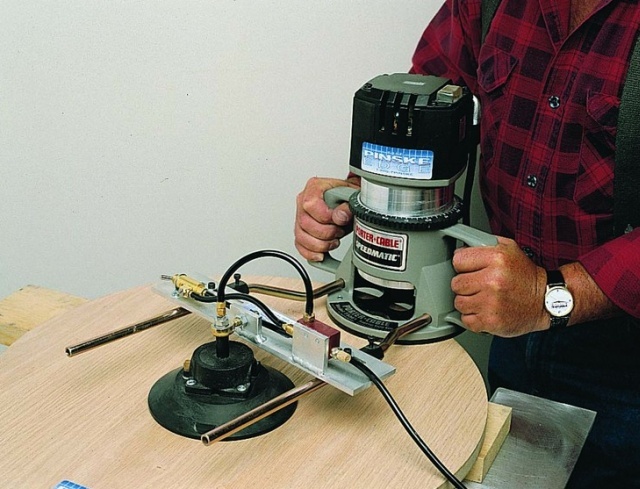 Adjust the extension arms to make any size circle from 13″ to 90″ in diameter. Next, attach your router to the extension arms (fits 2 1/2 – 3 1/4 HP routers). Now make the entire 360 degree circle in one cut. It’s really that simple. You can readjust the extension arms and add matching pinstripes, inlays or other custom touches. The Air Circle Compass holds securely on wood and plastic laminate as well as solid surface!